Situated in quiet area, 5 minutes from 3 golf courses and beach. Sleeps a mixture of adults and children up to10 individuals . Close to community pools. Shops in short walking distance. 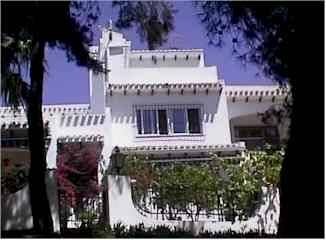 We wanted a villa that was near to the beach, and to golf courses and the airport. The location we chose is a mature urbanisation (about 20 years old) and unlikely to have any development in close proximity. There are three golf courses within 5 minutes drive and the nearest beach is around 5 minutes away by car. The Villamartin Plaza has a large choice of restaurants and is only a short drive or a long walk away the area has a number of commercial (shopping) centres both a short walk and a short drive away. Generally there are up to 320 days of sunshine a year and the nearby Torreveija salt lakes give a very dry micro-climate, excellant for those with arthritis. You may find that you need a car to get the best out of your holiday. However there is an hourly bus service to and from the beach at La Zenia. Taxis are available in the area. Some visitors prefer to stay in the local area and use public transport. Our caretaker can provide a pickup service to and from the airports. The main attraction is the climate - especially between April and October. The beaches stretch for miles both North and South. Campoamor golf club has a fine course and a sports complex attached plus a magnificent clubhouse. Villamartin also boasts a fine course plus tennis courts & restaurant. There are local bars 300 yards up the road into the next development (Pueblo Principe). There is a country style club one mile away at San Juan (Eduardos Finca) which has a pool, BBQ bar and Restaurant. Scuba lessons for beginners are run here. The community pools ( nearest as per photo 25 yds from house) are generally quiet (but more lively in July and August) and have both adult and kiddies pools. You are close to the historic towns of Elche (with the largest palm forest in Europe), Orihuela, and Cartagena (historic sites going back to pre Roman times). There is a good water park in Torrevieja, and the seafront is well worth a visit for a stroll alongside its cafes, bars, discos and street market. Water sports are available here. Drive up the coast to the theme parks at Benidorm or south and inland for the Murcia region and the Mar Menor (a warm lagoon bounded by La Manga). We provide a housebook of instructions on the household appliances, a visitors book for your comments and a book containing guides for local attractions. There are now (or in course of construction) in excess of 15 golf courses with in 45 minutes of Villamartin. Ask the owners for details and how to book a round. The two double bedrooms are family rooms and have dressing rooms with space for two single beds (or a cot). An additional folding bed is also available. We consider that the house is only suitable for 10 people if at least 2 are children.We are happy for smokers to smoke on the balconies and patio areas.